However, this early line-up was to prove short-lived, with the Woods departing before the band's first gig, to be replaced by Martin Carthy, already a fixture on the folk scene, and classically trained fiddle player Peter Knight. Their 1970 album Please To See the King became a classic, while Ten Man Mop made inroads into the rock scene. Further line-up changes ensued after this, with Hutchings leaving to form The Albion Band, followed shortly afterwards by Martin Carthy, Steeleye being joined by Rick Kemp on bass, Bob Johnson on guitar and Nigel Pegrum becoming the band's first drummer. With a more rock-oriented approach, it was this line-up that enjoyed the biggest commercial success, with the acapella Latin carol Gaudete giving a Christmas chart entry in 1973 and a No 5 hit in 1975 with All Around My Hat produced by Mike Batt. After this run of mainstream success Bob Johnson and Peter Knight quit the band in 1977 after making a duo album The King of Elfland's Daughter. With another album and tour in the pipeline, Martin Carthy rejoined bringing with him squeezebox ace John Kirkpatrick, giving the band's trademark folk-rock sound a distinctly English folk flavour. This tour was to be the last for a while, as the band went their separate ways. But it was only a matter of time before they reconvened, releasing Sails of Silver in 1980 and Back in Line in 1986. The '80s were an evolving time, with Tim Hart leaving the band, Tim Harries replacing Rick Kemp on bass, Liam Genockey occupying Pegrum's place behind the drum kit. But the strength of Steeleye Span has always been the band's ability to draw on the different musical personalities of the members and remain greater than the sum of its parts. 1995 was a major landmark for the band: the 25th anniversary was celebrated with a one-off reunion of all members past and present for a charity gig at the Forum in London. The live album The Journey, released in 1999, serves as a reminder of Steeleye's importance in the development of British roots music, with a personnel list reading like who's who of folk. If The Journey was a celebration of what had gone before, Steeleye's 1996 album Time showed the band equally able to move towards the future, hailed as their best in years by critics and fans alike. A further development was the return of original member singer Gay Woods, adding another dimension to the band's sound. Further changes were afoot when Maddy left in 1997 to concentrate on her mounting solo work. 1998's mainly acoustic album Horkstow Grange saw the band withstand the change with Gay Woods' voice coming to the fore, and a more Irish element displayed in the band's music. 2000's release Bedlam Born saw Steeleye move further on with an album that married true rock energy to their traditional material, while exploring some decidedly more experimental territory. 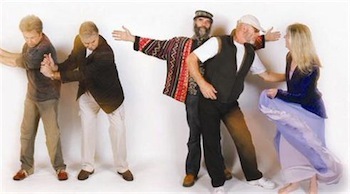 With Maddy returning to the band in 2002, Steeleye Span reformed with a "classic" lineup, with Maddy being joined by Peter Knight Rick Kemp, Liam Genockey and Bob Johnson. This year saw them release a 2-disc album, Present – The Very Best of Steeleye Span, an album revisiting their greatest moments, as decided by their fans in an online poll. By 2004 Ken Nicol was on board and the band released the album They Called Her Babylon early in the year, extensively touring the UK, Europe and Australia. Their prolific output continued with the release of the Christmas album Winter later the same year, as the band ended a busy year of touring with a gala performance in London's Palladium theatre. Even with a career that has brought incredible, twenty-one studio albums, British folk legends Steeleye Span's history still includes a number of records that stand out as landmarks. 1974's Now We Are Six was one such moment, an album that saw the band expand both their line up to a six piece and with it their sound to explore even further their own unique blend of rock and folk music. A critical and commercial success, the record would provide a home to a number of band classics down the years, including the famous 'Thomas The Rhymer'. Ever ones to experiment, Steeleye also offered their version of Phil Spector's 'To Know Him Is To Love Him' – featuring David Bowie on saxophone. In 2011 having established the longest serving line-up of their career, the departure of guitarist Ken Nicol necessitated another change of personnel and, with the addition of Julian Littman, Pete Zorn and Rick Kemp back on Bass, there could have been no better time then to go back to the iconic record " Now We Are Six". Releasing a double live album and tacking it on an extensive UK tour, performing it in its entirety. With the new members joining Steeleye lynchpins Maddy Prior, Peter Knight, Liam Genockey and Rick Kemp, the shows brought a new twist to familiar material – adding experience gained over an illustrious career. The band released their new album Wintersmith in collaboration with Sir Terry Pratchett at the end of 2013. A record based on Pratchett's Wintersmith novel, the subject matter was completely appropriate for Steeleye, a tale of ancient rituals and secret folk dances that perfectly complemented their previous work whilst taking it in new directions. 2014 sees Steeleye Span emerging on another new exciting chapter. With the departure of fiddle player and long standing member Peter Knight the Ireland tour will see the band introduce Jessie May Smart. A departure to what we have come accustomed to with Steeleye Span, Jessie is a young, vibrant talent who trained with Richard Ireland at Trinity College of Music before going onto The University of Nottingham and who's CV includes working on The X Factor and with Katie Melua.